What a glorious weekend! Yahoo treated us like royalty; from our fabulous rooms at the Four Seasons Palo Alto, where everything and everyone was impeccable, to the purple carpet roll-out to food, food, and drink; that alone was amazing. What really made the Yahoo! Mother Board summit were the Mother Board members: smart, funny, incredible women who inspire me. 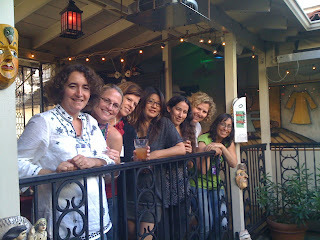 I was already excited to spend time with the women I already know and love: the LA contingent. From left to right, MarVistaMom (and thanks for this pic, Sarah), The GoToMom, YvonneinLA, sweatpantsmom, me, Elise and SoCalMom. The girls and I flew up together and got to ride in the car Yahoo! had arranged for us to get to the hotel. Their aunt picked them up from there, and I went up to admire the room. It was beyond gorgeous! Huge flat-screen TV, the necessary coffee, a Boss stereo where I could hook in my iPod, a lovely enormous bath, a separate gorgeous shower, and the mother of all indulgences, a TV perfectly suited for bath viewing! And that was the first thing I did. I ran into Elise, Yvonne and Sarah in the lobby, and joined them for lunch in downtown Palo Alto at Joya, where everything was exquisite, but I fell hard for their Kobe mini-burgers with chorizo. YUM! After a stop at Starbucks, we ended up walking back to the hotel. From the lovely downtown area to the residential area, everything was gorgeous. Our first event was a cocktail party at the hotel's pool. Again, great food, and even better, yummy cocktails. The party continued well after cocktail hour at the hotel's bar and at a crafting party. I started meeting the other mothers, including the fabulous Glennia, hooeycritic, Meagan Francis, and too many others. On Friday morning, we arrived at Yahoo! headquarters, where we took the purple carpet to our summit. There was breakfast waiting for us, and we spent the rest of the day in conference. They also included plenty of breaks, each one with yet more food! I'll write more about the actual conferences later, but we learned more about Flickr, Shine, Yahoo! Green, Yahoo for Good, cybersafety, blogging & SEO tips, and great stuff to come. After meeting and learning so much from all the great people at Yahoo, we were taken to Nola's for dinner (where the picture above was taken). We had that second floor all to ourselves, and had a great time. Glennia had arranged for a private room in a Korean Karaoke joint, where a bunch of us made fools of ourselves, and laughed at the videos where someone always dies a gruesome in a B movie kind of way. On Saturday, we all parted ways, and I joined the girls' aunt and their cousins. We went to see a movie, which was so bad I kept falling asleep, but the kids loved it, and then back to their aunt's house. This is my X's sister. She's an amazing and lovely woman and we had a nice chat while the kids enjoyed the last of their time together. She has one daughter Riley's age, and a son a little bit younger. She said when they got together, even though it's been two years, it was like a minute had just passed, and they immediately had a great time playing together. She took them all to Great America on Friday, and it sounds like they spent the rest of the time swimming. Their father did show up on Thursday night after dinner, but not for long. He told them he'd be back on Friday night for dinner, but then said he had to work, and then did the same thing again on Saturday. They took it all in stride. As Riley was telling me how he didn't show up on Friday night, Sylvia said, "I told you not to count on it." It broke my heart all while I was so proud of her for understanding that about X now. He said he had to work, which just makes me nauseous. Most times, when fathers have to work, their children enjoy the benefits. So I guess I can be expecting a child support payment any day now, right? Don't worry, I'm not holding my breath. They've kept their comments to, "at least we got to see him," and certainly didn't let it interfere with enjoying the time with their relatives. We were all happy to come home. And Riley's just spilled cereal all over the place. Ah, yes. We're back to reality! That conference sounds so fun! I'm glad you were treated to a life of luxury - every momma needs that! And you should definitely be proud of how well your kids handled their dad. I REALLY hope that if my ex turns into a big disappointment, my girls will learn to accept it as well. In the back of my head though, I keep hoping he'll prove me wrong (he rarely does though). So glad it was a good time for EVERYONE. Everyone deserves to be spoiled once in a while. I'm glad you had a good time. I would have been surprised to read that the visit from the ex went any better than what you described. Like Jenni said, kudos to you for coaching your girls so well. The way your girls handled the disappointment says a lot about youru parenting. Good job Mom! This sounds fantastic -- I'm jealous! Holy crap that sounds like fun!! That rocks....so glad you were able to get out there and enjoy!